high-performance heatsinks or water-cooling solutions. The Evolution of Cool! Céramique uses a high-density layered composite of five unique shapes of thermally conductive aluminum oxide, boron nitride and zinc oxide sub-micron particles to maximize particle-to-particle contact area and thermal transfer in micro to moderate bond line situations. This exclusive combination provides performance exceeding most metal based compounds. Céramique is engineered to not separate, run, migrate, or bleed. 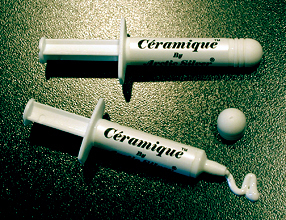 Céramique does not contain any metal or other electrically conductive materials. It is a pure electrical insulator, neither electrically conductive nor capacitive. The 2.5-gram Céramique is the first product available in our proprietary thermal compound syringe. Our new syringe is more compact, easier to handle and dispenses a higher percentage of its content than standard industrial or medical syringes. The amount of compound remaining in the syringe is easy to determine as the rear of the plunger is perfectly flush with the flange when the syringe is empty. At a layer 0.003" thick, one syringe will cover approximately 20 square inches. At a layer 0.003" thick, one syringe will cover approximately 160 square inches. Due to the unique shapes and sizes of the particles in Céramique, it will take a minimum of 25 hours and several thermal cycles to achieve maximum particle to particle thermal conduction and for the heatsink to CPU interface to reach maximum conductivity. (This period will be longer in a system without a fan on the heatsink.) On systems measuring actual internal core temperatures via the CPU's internal diode, the measured temperature will often drop slightly over this "break-in" period. This break-in will occur during the normal use of the computer as long as the computer is turned off from time to time and the interface is allowed to cool to room temperature. Once the break-in is complete, the computer can be left on if desired. © 2012 Arctic Silver, Inc. All Rights Reserved. All trademarks used in this site are the property of their owners. Join us on facebook.